It's amazing to me how quickly things change. Up one minute. Down the next. This goes for Finleigh's moods - as evidenced by the above picture, one minute happily sipping away at her "coffee" with mommy, the next minutes knocking over her coffee and crying over it. In dealing with what has become a daily ritual, we make sure not to put too much liquid in her cup or we put a lid on it. It's like she's three again. She's been doing so well too. But this isn't accidental or careless spilling, this is purposeful, looking at the cup and then knocking it over - or sometimes even throwing it. Is it really purposeful? We're not sure. It is perhaps an uncontrollable urge. We just don't know. What I do know... is that it's intensely frustrating. The ups and downs also go for my moods. Me. I slide from one mood to another. Sometimes feeling so very content with my life. When I sit, coffee in hand, Mumford and Sons blasting in the background (yes... you can blast Mumford and Sons), in a quiet house, I feel happy and content. Grateful for my home. My family. My husband. That feeling, unfortunately, is illusive. More often, I feel frustrated. I feel discontent. Wishing for something better. Wishing for a life that doesn't involve a screaming child, an angry, destructive, uncooperative, screaming child. Or, even when there is no screaming, I wish for my six year old to follow simple directions. Simple, age appropriate directions. Like getting dressed. Or going to bed. Or leaving her brother's things alone. Or even just a bit of predictability. Predictability would be nice. And then I feel annoyed. Annoyed at all the people that feel they have a right to have an opinion about Finleigh and what she does at home. OT, PT, speech, behaviour, development. She has workers for each of those things and that doesn't include her aide, her teacher, her respite worker, her social worker, the special needs director at the school. Don't get me wrong, I love every single one of these people. They are lovely, caring, competent people that I'm very thankful to have in my life - given my daughter's challenges. But Oh. My. Word. Enough already!!! I'm tired of being told how to parent and live my life and do things that other people get to do in private. Complete and utter private. There are so many people in my life right now that are here to see me at my worst as I struggle to control my child and fail. Failure... not my favourite thing. At all. Then I feel hopeless because even though I get through one day, the next day is around the corner. And the next and the next and the next. And I don't see an end. There will never be an end. Not really. Then I feel happy again as I laugh at something one of my kids did. Or something my husband says. Or have a meaningful moment with someone. Or get some time alone. Oh how I love being alone. So, alone I sit, mulling over all my feelings. This post only touches a few of them, but I expect you get the point. No matter how much my feelings and thoughts fluctuate, I promise I won't throw my coffee across the room. Because I like my coffee too much, mostly. So, it would be safe to come over and have coffee with me. If only you didn't all live so very far away. (Except for those who don't. Come over for coffee. 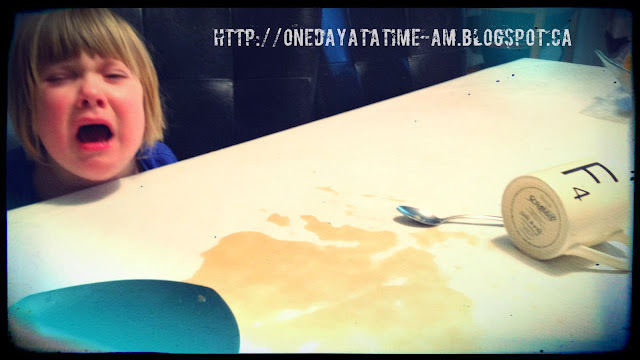 I promise I won't throw coffee at you even if I can't promise the same of my daughter). I should also say that one of my ups is being so thankful for SMS. Thankful and not... all at the same time. For one thing... I met you. yes. so many ups and downs. I think we all could use a few more ups myself.